It seems a long while since I got stuck into an Amanda Prowse novel, so when The Art of Hiding dropped through my letterbox, I was excited to get started right away! What I love about Amanda's books is her ability to take what appears to be a normal family and turn their world upside down, resulting in the heroine of the book becoming a strong and confident woman... and as a read Amanda manages to break your heart before fixing it again by giving an uplifting ending which in my opinion makes great reading material. Nina's story is no different. She has a wonderful life, a gorgeous husband, two handsome son's and a marvellously grand home which includes a cinema room and swimming pool! Nina wants for nothing as her husband, Finn, owns a successful construction company. Her boys, Connor and Declan, go to a top of the range private school and she even has fresh flowers delivered fortnightly to her home! Life is good for Nina and her family, that is until Finn fails to arrive at one of Connor's rugby matches. Willing him to hurry up and arrive, Nina answers her mobile which is the point her life as she knows it, is to be no more. 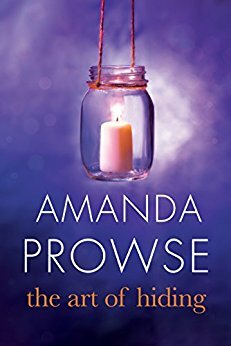 Finn has been involved in an accident and sadly not made it, the story quickly travels through scenes where Nina has to tell the boys their Dad has died, the funeral and immediate aftermath, all of which Amanda writes with warmth and empathy which is guaranteed to bring a tear to your eye. Once the funeral is over, Nina discovers from Finn's accountant that they are bankrupt - the business has been financially failing, the boys' school fees are behind and their home, with all their precious memories of family times with Finn, is about to be repossessed with the bailiffs expected to arrive any day. It's hard to comprehend how you would feel in this situation but Amanda being her, writes expertly as Nina goes through grief, shock, upset and anger. With no choice, Nina and the boys pack up what little is left and head to Southampton to stay in a run down flat owned by a distant relative. It's not ideal but with pennies to her name, Nina sets about making the best of a bad situation - enrolling the boys in a local school and looking for a job to bring in some income, all whilst trying to hold it together for the boys and trying to build some bridges with her sister that had broken over the years. I love the way Amanda took Nina as a character, pretty much ruined her life and then re-built her into that strong, confident, independent woman she does so well. The Art of Hiding is an emotional roller-coaster of a read, by the end you will have tears forming in your eyes again but of the happier ones as you see how far Nina and the boys have come in a few months and this is due to Amanda's ability to write about characters you instantly connect with. I also love that the title, The Art of Hiding, has more than one meaning - Finn hides away their money troubles, Nina and the woman she was hiding away in their mansion and Connor hiding away his feelings. The Art of Hiding is a fabulous, warm and uplifting (despite the original heartache!) book about new beginnings, moving on and finding that inner strength.